Roadrunner Autoflowering cannabis seeds by Dinafem Seeds belong to a feminized, autoflowering, slightly Indica-dominant cannabis strain obtained by crossing a Lr#1 and a Dinafem#1, which resulted in the first auto of our catalogue. Roadrunner Autoflowering is a great way of discovering the advantages of cultivating an autoflowering strain. 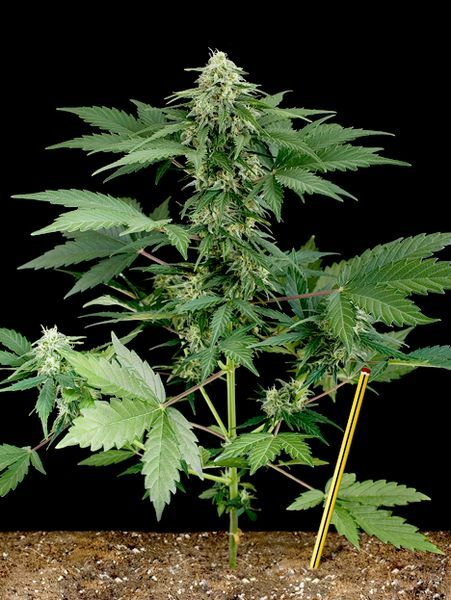 This beautiful, fast-flowering, vigorous marijuana plant produces dense buds covered in resin and it is one of the easiest cannabis strains to grow. Roadrunner Autoflowering cannabis seed provides good results in small indoor spaces. Outdoors it prefers continental/temperate/Mediterranean climates and the greenhouse. It is good to add 1/3 of coco fibre to the soil mix in order to improve air circulation and the metabolism of the plant. Water often but sparingly and it has low water requirements. The flavour and aroma are pronounced, with hints of citrus, wood and spices. The effect is powerful, more physical than cerebral and long-lasting. It is the perfect cannabis strain to rest deeply.